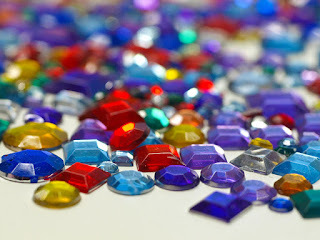 March 13 is National Jewel Day! Yes another reason to celebrate. This year, not only is it National Jewel Day, it is also 3-13-13 which is kind of awesome in and of itself. I don't wear alot of jewelry but I do appreciate a lovely Jewel. And as my friend Carissa Rogers from GoodnCrazy.com reminded me, I did grow up in the Emerald City. But I am not traveling today, so instead I am just going to go online and visit my friend's website Cynthia Wolf Jewelry and watch the slideshow of beautiful jewels on her landing page THEN go to her facebook page and see what is new there (it is really a beautiful facebook page worthy of 'liking'). Send a note to someone in your life who is a true Jewel. Listen to the soundtrack from Wicked especially the song "One Fine Day"